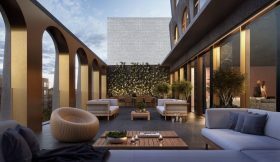 With construction officially underway at 130 William Street and sales launching for the 244 condos later this month, Sir David Adjaye hosted an event last night to reveal the interiors of his 800-foot Financial District tower. And they’re just as chic as expected, with finishes made from materials sourced from all over the world and hardware designed by the starchitect himself. 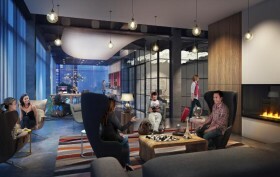 Adjaye Associates collaborated with Hill West Architects on the project. Back in April 6sqft reported on the progress of British-Ghanian architect David Adjaye’s first NYC skyscraper at 130 William street, with the nearly-800-foot tower at street level and rising. Adjaye, who has achieved international renown for projects like the Smithsonian’s National Museum of African American History and Culture in Washington, has been knighted by Queen Elizabeth II and named one of TIME’s 2017 most influential people, was inspired by the historic masonry architecture of the Financial District for the new building’s anything-but-ordinary design. And we’re now seeing more of that design: The New York Times reveals information on what the pricing for the building’s 800 units is likely to be once sales launch, along with some new renderings of its unique architecture and interiors. Let’s hear those prices. And when can we move in? 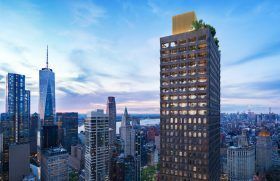 Four months after revealing renderings for his first NYC skyscraper, esteemed British architect David Adjaye is finally seeing the project get off the ground. CityRealty reports that construction at 130 William Street has reached street level, with a red kangaroo crane in the ready to begin its nearly 800-foot-tall rise. 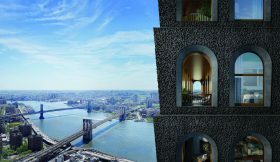 The Ghana-born architect, who was knighted by Queen Elizabeth II and named one of TIME’s 2017 most influential people, has said the condo tower was inspired by the historic masonry architecture of the Financial District. Nearly four years after wrapping up his first NYC project, Harlem’s Sugar Hill affordable housing development, renowned British architect David Adjaye is inching closer to completing his first skyscraper in the city. 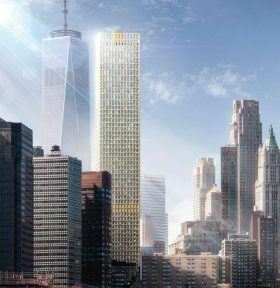 Preliminary plans for his Financial District condo tower surfaced in May, but developer Lightstone has shared the first official reveal of the tower, now known as 130 William. The height has increased from 750 to 800 feet, or 61 to 66 stories, and it will hold 244 residences. Adjaye says the “rich history” of one of “the city’s earliest streets” influenced the building’s unique concrete form. “I was inspired to craft a building that turns away from the commercial feel of glass and that instead celebrates New York’s heritage of masonry architecture with a distinctive presence in Manhattan’s skyline,” he said. 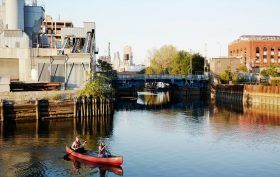 When the Lightstone Group revealed their two-building, 700-unit, $350 million rental project at 363-365 Bond Street, right on the banks of the notoriously toxic Gowanus Canal, president Mitchell Hochberg said it was inspired by a residential project in the Canal Saint-Martin neighborhood in Paris that helped create a “newly hip atmosphere” near a similarly polluted waterway. 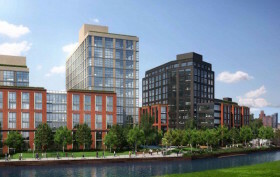 Despite the area’s Superfund status, the promise of living in a trendy, up-and-coming area surely appealed to many; when the lottery opened for the 86 affordable units at #365, nearly 60,000 people applied. 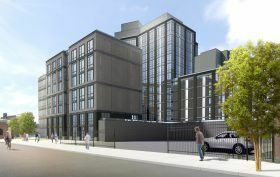 Now, the lottery is opening for the 54 below-market rate apartments at the under-construction #363, ranging from $833/month studios to $1,082/two-bedrooms, available to those earning 60 percent of the area median income.